Howdy partners! 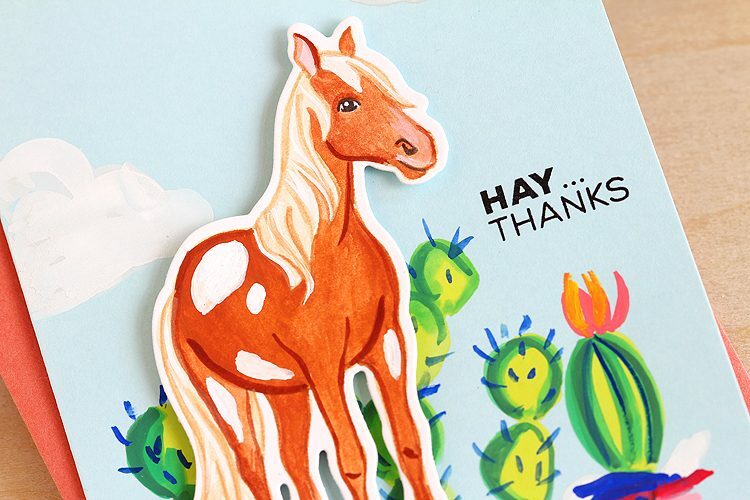 Today I’m sharing a card made with the May release of the Technique Tuesday Animal House stamps: Hanna Horse! Aren’t those sentiments just the best?? I love them like WHOA! (Sorry couldn’t resist.) 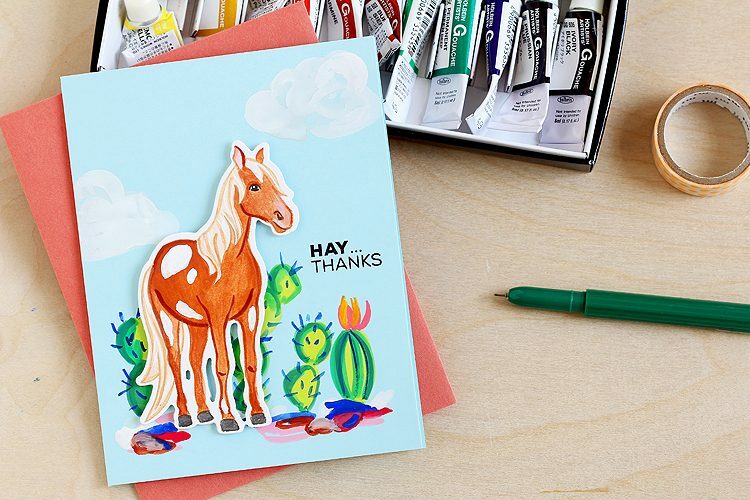 I also love that you can get started on your Christmas cards early with that MARE-Y Christmas one. 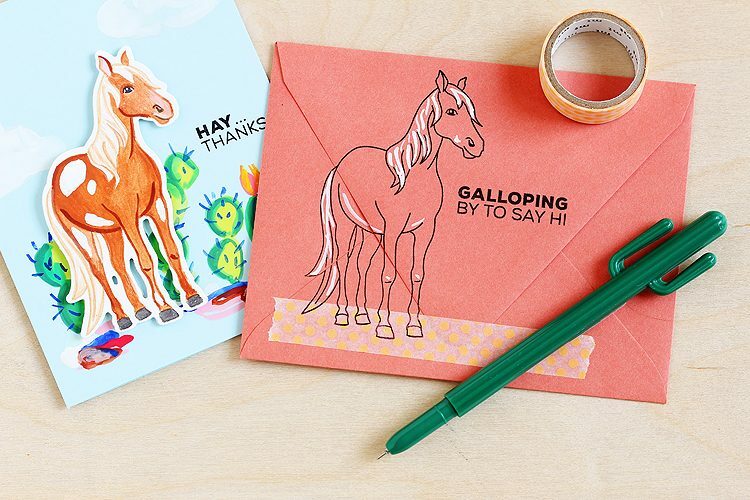 And that these will work equally well for both the cowboys and cowgirls in our lives! Hanna is a happy horse, who spends most of her days galloping around a barn and field on the West side. She is prides herself as being extremely active in Animal House community. She is very busy! She loves working out and does it often. Running around through the field and practicing jumping are her most favorite forms of exercise. She also loves spending lots of time horsin’ around with her horse friends! Hanna also serves as a volunteer in a horse ridership program for young horse riders. Seeing the children smile (and stealing kisses and pets from them) is her favorite reward for letting them ride on her back! Ha! Isn’t that the best? Now on to my card! Since I’ve been on quite the gouache kick lately I decided to use that to color her with and do a little “no-line-coloring” action. 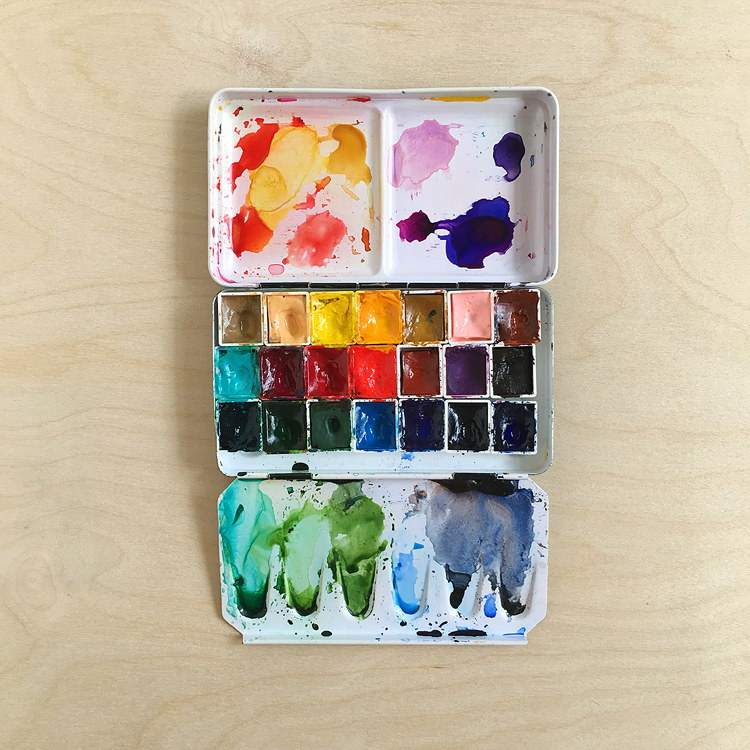 You can find out more about gouache in this post. I started off by inking her up with antique linen ink + a Tombow black marker for her eye — you can use any dye based marker for this, but not a permanent one like a sharpie or a Copic — those will just stain your stamp and not come off on the paper. I stamped her on bristol paper — love using this for gouache as it’s really smooth and it won’t buckle under layers of paint. 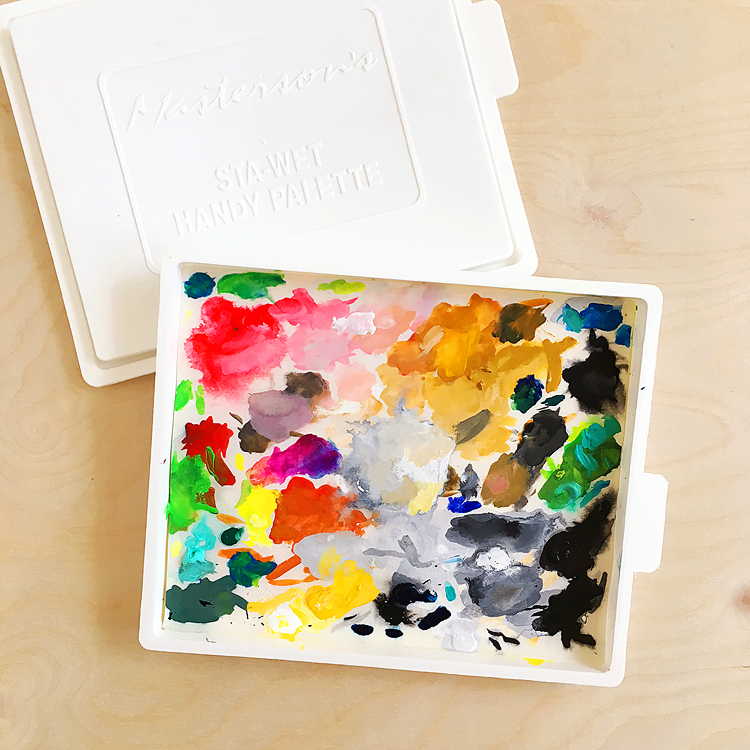 Then I started coloring away with gouache. The best thing about qouache is that you can add light colors over darks — so cool! I even decided to make a little western scene for her to roam around in — yep, gouache is opaque so it will even go over cardstock! Then I die cut her out with the matching die — because no way I’d want to cut those legs out myself! Nope not gonna happen. I added a few little details with white gouache and that was that! Can’t wait to get this in the mail. Before I go I just had to give another shout-out to Tam! We met just over a year ago at a crafty retreat and really hit it off — I kinda feel like we’re soul sisters. 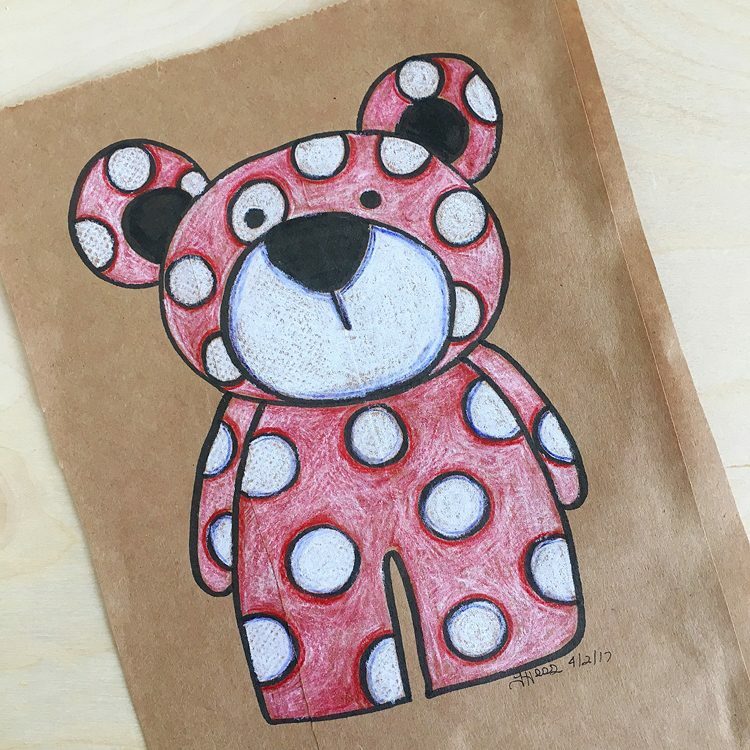 I still have this cute bear that she drew — on a paper bag — hanging in my office. Is she good or what? 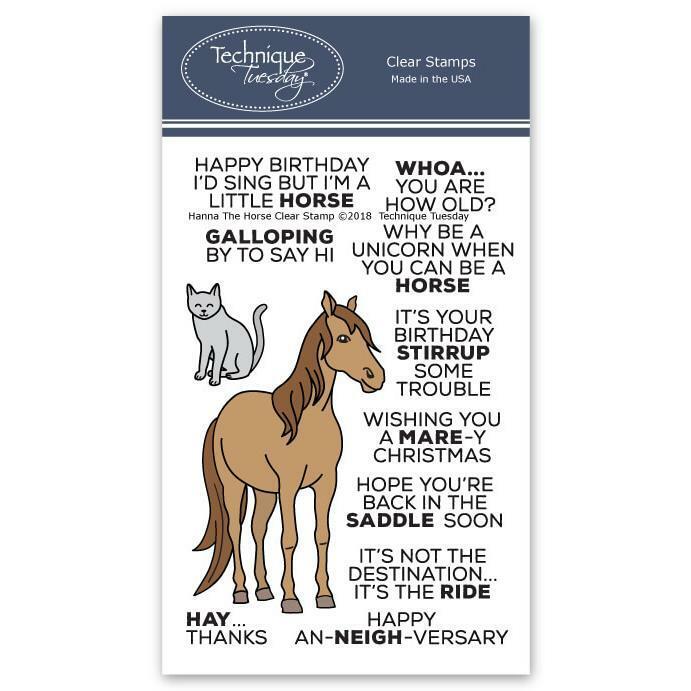 Find the Animal House stamps and dies right here at Technique Tuesday — you can purchase them individually or sign up for the monthly subscription program and save! Find out more over there. Love your card and envelope, Lisa! Thanks so much, Bev!!! Love TT!! !